Product content is one of the most important components of any e-commerce business. Whether it’s product descriptions, attributes, images, videos, reviews or buying guides, your content directly impacts your bottom line. Of course, as the manager of your company’s online catalog, you already know this. But how do you convince key decision-makers in your organization that they need to invest in better product content? Here are a few key stats and KPIs you can use to make your business case. How do consumers determine what to buy? Product content is consistently ranked as one of the top three factors that influence consumers most when buying. What type of content matters most? Specs, reviews and images are the biggest factors that drive purchasing decisions. What happens if people don’t encounter great content? 98% of consumers have abandoned their shopping efforts because they couldn’t find the information they need. Why is average time on page important? It’s simple: The likelihood of conversion goes up when a consumer spends more time on a page. How to use it: Compile a list of product pages with good organic traffic and a lower-than-average time on page. Improve the product content, monitor engagement metrics, and present the results to your exec team. "The likelihood of conversion goes up when a consumer spends more time on a page." One of the most common reasons consumers return an item and leave an unflattering review is because the item they received didn’t live up to the expectations set in its description. Bad reviews not only indicate that you’ve lost a current customer, but they also scare away future shoppers. According to this infographic from Business2Community, “86% of people will hesitate to buy from a business that has negative online reviews.” Accurate product content can minimize the number of poor ratings, increase sales, and decrease return rates. How to use it: Compile a list of product pages with good organic traffic and poor customer reviews. Audit the product content for accuracy, monitor review and return metrics, and present the results to your exec team. "86% of people will hesitate to buy from a business that has negative online reviews." When a customer initiates a chat, it’s not necessarily a bad thing. If they are unsure about making a purchase, a customer service rep has the chance to save the sale. However, if customers frequently use the chat feature to ask questions about a specific product, this can be an indicator of inadequate product information. Better product content can mean spending less money on labor resources to handle online inquiries. How to use it: Determine which products your customer service team is spending the most time answering questions about. Look for patterns within the questions, optimize your product page content to include the answers, and present the cost-savings results to your exec team. "Better product content can mean spending less money on labor resources to handle online inquiries." How do you stay competitive when other merchants are trying to undercut you with lower prices? Even though online shoppers love getting the best deal, they also like to be aware of exactly what they are buying. That’s why they rely heavily on product content such as descriptions and reviews. Detailed content boosts consumer confidence. Even if they could buy a similar (or even identical) product somewhere else for a similar price, they are more likely to buy from the store that has the most complete information available. How to use it: Compile a list of high-margin products that your competitors are offering at lower prices. Rather than slashing your prices, spend some time beefing up the product page content to ensure it’s more robust than your competitors’. Present the ROI results to your exec team. "Even if consumers can buy a similar (or even identical) product somewhere else for a similar price, they are more likely to buy from the store that has the most complete information available." What About KPIs Like Search Traffic and Conversions? 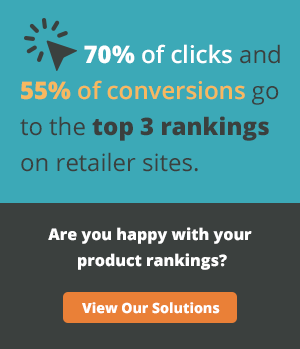 At OneSpace, we’ve found that clients can increase organic search traffic by up to 84% by publishing unique product descriptions. Compelling content that details key features and benefits can also increase online conversions by a minimum of 30%. To find out how we can help your organization achieve these same results, apply now to receive five free product descriptions.